Saturn's moon Iapetus boasts a ridge around its equator that gives the moon its walnut-like appearance. A collapsing ring may have formed the unusual ridge on Saturn's walnut-shaped moon, Iapetus. New simulations reveal that a slow-falling ring of debris may have scoured the moon's surface, creating the peaks, whose origins have long puzzled astronomers. Such a dramatic pileup would have built up the ridge, a unique feature in the solar system. When NASA's Cassini mission arrived at Saturn, the probe revealed a continuous series of peaks along Iapetus' equator. Viewed from the right angle, these ridges, which give the moon a walnut appearance, prominently protrude along the edge. Figuring out how the mountains formed has puzzled scientists since the features' discovery. "This behaves somewhat like a traffic jam," Angela Stickle told Space.com by email. Stickle, a planetary scientist at the Johns Hopkins University Applied Physics Laboratory (APL), and her colleague James Roberts, also at the APL, simulated the slow collapse of a ring around Iapetus. They found that the resulting "infall" could create features that would explain the walnut ring found on the moon today. "As the entire disk collapses, this traffic jam grows and can leave a raised ridge behind," Stickle said. Iapetus boasts a prominent ridge that stands out on the surface. The unusual mountains are the tallest in the solar system relative to their parent body. Although it is Saturn's third largest moon, Iapetus is only about an eighth as wide as Earth. The massive ridge follows the moon's equator, with peaks as high as 12 miles (20 kilometers). The soaring heights on the small moon make the ridge the tallest mountain range in the solar system relative to the body it's on, Stickle said. If you stood on the surface of Iapetus, Stickle said, the peaks would soar above you, much like the Himalayas or Rocky Mountains on Earth, while stretching from one horizon to the other. "On Iapetus, due to the lack of atmosphere, you'd also get to see space behind you, and perhaps Saturn as well," she said. "I imagine it'd be a pretty striking sight!" For all their grandeur, the peaks' source has remained a remarkable puzzle. Over the years, scientists have proposed a range of solutions, from tidal bulges to fault thrusting to a warmer interior in the past. Each of these potential explanations has its own faults, and many of them require very specific initial circumstances. A new view of the Saturn moon Iapetus, as seen by the Cassini spacecraft. "An issue with these sorts of models is that we don't know how likely those necessary starting conditions are to have occurred," Stickle said. A handful of studies have proposed that something outside of the moon birthed the striking ridges. An object slamming into Iapetus could have created a debris disk — and perhaps a lost natural satellite, or "submoon" — that would have orbited around Iapetus' equator. Tidal interactions could have pulled the ring debris inward, while Saturn would have stripped off the submoon. With this possibility in mind, Stickle and Roberts simulated what would happen as a ring of debris fell onto the tiny moon. How the ring itself formed didn't matter as much as what happened once it was in place, though the researchers expect that it formed out of the same ice-rich material that makes up Iapetus, they said. 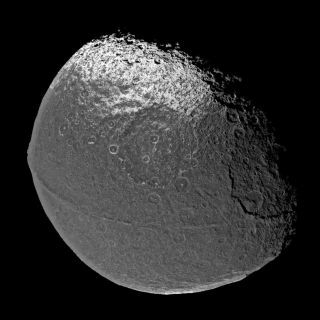 "The disk is likely made up of fragments of material from a large, earlier impact into the surface of Iapetus," Stickle said. "The particles are most likely ice, though there might be some rocky material mixed in." If the debris fell slowly enough, and at a low enough angle, it could hit the surface without carving out the craters generally associated with impacts, Stickle said. Mars and Earth's moon both have elongated craters created by oblique impacts, bearing mute testimony that not all impacts are head-on. The grazing angle of the ring debris would mean that the rocky ices hitting the surface would slide, scouring the surface, the researchers said. Significant portions of the projectile would be sheared off and slide as well, coming to rest downrange of the initial collision. When the next impactor fell, it would interact with the fragments and the scraped-up topography created by the first round of material, the scientists said. Successive waves of material would skid along the surface of the moon, piling up behind previous rounds. This would create a sheared, raised ridge. Because Iapetus is mostly ice, the researchers also examined how heat from the impact might affect the surface. They found that, even for the largest impactors, temperatures would be localized to where the objects struck the ground. During the crash, ice would melt enough on the moon's surface and the falling ring material that debris would skate along the crust. However, the temperature change wouldn't weaken the crust and prevent the formation of the landmark ridges, the researchers found.